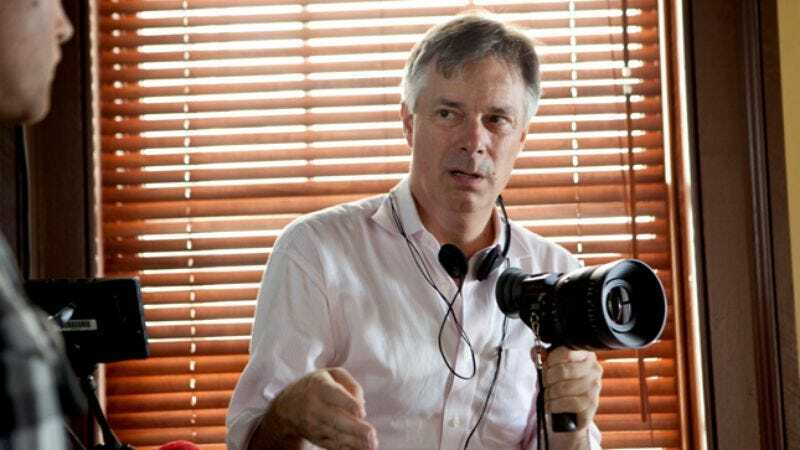 Whit Stillman made films every four years until he stopped. He debuted in 1990 with Metropolitan, which introduced viewers to the sort of characters who would populate his next two films: young people whose obsessive self-reflection often got in the way of their own happiness. Inspired by Jane Austen (and in some ways a riff on Mansfield Park), it similarly explored the relationship between manners and morals, and the ways they don’t always match up for characters still figuring out what they want to be when they grow up, even as they present themselves as adults to the rest of the world. Two similarly entertaining films followed: Barcelona in 1994 and The Last Days Of Disco in 1998. But in the ’00s, Stillman has become the subject of “Whatever happened to…” questions. That’s about to change with the debut of Damsels In Distress, Stillman’s first film after more than a decade of false starts, including a Revolutionary War movie, adaptations of Austen and Red Azalea, and a film set in the 1960s Jamaican music scene, which he still hopes to make. Damsels is a departure of a sort. Stillman’s characters remain recognizably his, but they live in a world that’s a little off reality. Set at an East Coast college that’s only recently admitted women, the film stars Greta Gerwig as the head of a pack of female students who hope to improve their campus, and the world, through suicide-prevention counseling and good grooming. And dancing. Stillman hopes The Sambola, the dance Gerwig spends part of the film trying to popularize, will catch on in the real world. (And why not? Give it a listen.) Stillman recently spoke to The A.V. Club about returning to a new, cheaper world of indie filmmaking, the importance of showering, and his love for the film Old School. The A.V. Club: This is the first film you made that’s set in the present. Whit Stillman: Sort of the present. AVC: Ostensibly the present. There aren’t a lot of 2012 signifiers, but it doesn’t seem like we’re watching something from a different era. Is that because you see the heroines’ task of civilizing the uncivilized world as more urgent now than in previous decades? WS: I just think they are forward-looking people solving the world’s problems. This is more utopian. I mean, all the films are kind of utopias. This is more frankly utopian in its comic trajectory, so it’s good having it now, so people can’t dismiss it and say, “Oh, it’s girls back in the ’50s.” People can dismiss a period film and say, “Oh, this was just back then.” I like the idea of bringing period into a present-day film. It’s period as a way of solving our problems. The things that worked in the past have been tested a little bit, while the solutions to the future have not been tested. We know that people taking showers is going to have good results. Up to a point. AVC: This is different from your previous films in a number of ways, most immediately in that it’s a more stylized world. Did you set out to consciously break from what people might have expected from a Whit Stillman film? WS: Well, it’s sort of a whole different—not a whole different kettle of fish, it’s a half-different kettle of fish. The other films were based on traumatic incidents and episodes and milieus I knew. I knew the scene, I knew the place, the time. I was recreating something in my mind in a way that was preferable, probably, to the way it actually was. But still, it was based on that. This was not based on a particular memory of mine. It was based on some stories I heard of girls doing this kind of thing in all-male, or formerly all-male, universities, where they felt they hadn’t been properly feminized. The inception of the project was actually a tiny assignment I had back in 2000, when suddenly they said, “You can’t do this project we wanted you to write. Write this, write something else.” And I said, “Well, what about this idea?” And they said, “Oh, good idea, but you only have six weeks to write it.” It’s one of these things where they only got paid if they turned it in in six weeks. I don’t know what it was. But I tried this thing, and I can’t possibly write a script in six weeks, and from that, I think I only took the idea of the four girls with floral names trying to improve things with good sense, etc. And also the Roman letter fraternity system. So even that first stab was more in the world of comedy, and less in the world of naturalism. And then, over the years, I think my love for frat comedy grew. I like the film Old School very much, I like Will Ferrell in Elf, I like Will Ferrell’s sense of humor very much. I think the DU world, the fraternity world, is more that sort of territory. The director of the Dublin Film Festival, where Greta won the acting award, said it was Jane Austen meets Animal House. AVC: You’ve consistently focused on young protagonists, whereas some filmmakers, as they get older, their protagonists get older, too. Why the continued interest in people in their early 20s? WS: Well, there’s just so many reasons. They’re more fun to watch onscreen. It’s the period in life from 16 to 22 or 16 to 30, where people are forming their identities and creating themselves anew. They’re crossroads periods. [In Metropolitan,] Tom Townsend is sort of moving from having a pronounced, already-formed political position toward society to having to deal with actual experience with people and situations and having to revise his old loyalties. And that’s true definitely with the characters in this film. So it’s an interesting period for that reason. There are other advantages, too. I do like giving young people, my daughters, etc., the idea of other ways of being than they might get from everyone else. So everyone else is saying, “Oh, this is what you have to do to be cool.” And we’re saying, “Actually, no, you can be more this way.” So that’s part of it. When I was growing up, there was only Scrooge McDuck to look up to. Then, just in practical production terms, it’s ideal for the kind of productions I prefer to have. I really like working very low-budget, and I like working with people who, it’s not complicated to be with them, unnecessarily complicated. And once someone has more than an agent, often, it’s very complicated dealing with them. It’s much better to give people their first chance. Not a lot of people in the industry are giving people their first chance. It’s something we can try to do. They can work in our budget level happily without feeling like they’re being shortchanged. WS: I would say thoughts of suicide, or fantasies of suicide. We’re not really dealing with any very serious suicidal person in this. AVC: But certainly people who are not in very good places in their lives. AVC: How do you balance finding dramatic weight for those issues, while still remaining in this fundamentally comic world? WS: It seems to come naturally. There’s something very funny about people who think they’re in extremities with their lives. [Laughs.] And part of the problem, I think, of this sort of teetering danger toward suicidal thoughts in that age group, is an overdramatization of their situation, a sort of hopelessness, very present—focused, so the salutary affects of the passage of time aren’t being taken into consideration. And also in this overdramatization, the total lack of humorous perspective. So the tiny bit of therapeutic stuff we can do to change that dynamic. I mean, I’ve heard some of these stories of people who were put into some horribly humiliating situation and then did or might have attempted to do themselves harm, because of thinking how horrible this was, and that everybody was laughing at them or criticizing them. And actually, you know, not. And you have to think if they’d just waited two months, nothing would have happened. I think psychologically, though… I mean, I’ve had this experience myself. In two periods, I was just in terrible, terrible funks, and it was really just time passing. They went away. I never took any medication or anything. They didn’t seem to have medication back when I was a boy, in the 1840s. AVC: When we talked to Greta Gerwig, she said one thing that made playing her character easier was to play her as a female version of you, and that many of the opinions expressed by that character were yours as well. Do you agree with that statement? AVC: And the solutions she hits on are solutions you found helpful in your own life? WS: In a sense, yes. I think getting out of yourself, getting into a social context, and physical movement is very helpful. And tap-dancing certainly would be that. AVC: Is it possible to still have a dance craze these days? WS: Yes, yes. You’re gonna see this summer. Sambola international dance craze. It’s already been on Indiewire as a playlist, so it’s happening. AVC: Do you feel there’s a groundswell for it now? WS: I would say pre-groundswell. We’re in a pre-groundswell situation. AVC: When you weren’t making films, you were living in Paris. Did that give you a different perspective on America and specifically on the world you came from? WS: I couldn’t have made Barcelona, for instance, in the exact same way after my experience living in France, because I was pulled into the Barcelona situation because I fell in love with a girl in New York who’s from there, and she brought me back here to get married, and I met all her friends and got involved in the Spanish film business. But I was always thinking of everything from the American point of view. When I was in France, I felt I got more immersed into French culture and civilization and society under my own steam. I was very involved with a French woman who had children and a family and was living in their world. I’m still entirely 100 percent loyal to the United States, but there are a lot of things about French society and culture that I like very much, too. So I stopped thinking about it as an outsider might. AVC: While you weren’t making films, were you keeping up with films that were being made? WS: I was keeping up with everything, and I was trying to make films. I was writing scripts, so I sort of have five scripts in the trunk, and I’m a great believer in the trunk script. AVC: Speaking broadly, how do you feel like the world of film has changed between Last Days Of Disco and now? WS: It’s back to the ’80s, and I’m very happy with that. We’re just back where we were when I started trying to put Metropolitan together in 1988, and we’re kind of at the same budget level. I was talking to a very well-regarded filmmaker at a party, and I was saying, “We have to go way down on budget to make our films now, we’ve gotta go way down.” And then it came to talking about how way down that budget was, and I was thinking $2 million, and he was thinking $200,000. [Laughs.] And the truth is just exactly between those two numbers. If you take $2 million, take $200,000, take half of it, and that’s about where you have to… You cannot go much above $1.2 million making an independent film, or you’re pretty dead. And that’s a great creative place to be, because it simplifies your choices. You know, if some actor’s lawyer wants to negotiate a complicated deal, it’s probably not going to happen, and you might as well just understand that from the beginning. AVC: You have to emphasize elements that play to your strengths, like character and dialogue. Your CGI budget is probably pretty limited on the films you make. WS: For us, one of the biggest, important things is to get a location that becomes our hero location that we can use for almost everything. And that was a dream for Damsels In Distress. In the case of Metropolitan, we had this access to the townhouse. It was the Alan J. Lerner townhouse. A foundation was occupying it, and by some error, I think different people on the board thought they were giving us permission, and we sort of got in there by error. And we had 10 days in this wonderful location, and it really brought the cast together. We did Sally Fowler Rat Pack scenes there, and it was really a dream for us to have that at the beginning of our shoot. And then in Barcelona, we had this location, the Casa Perez, and it was one of these apartment blocks in the beautiful part of Sanchez in Barcelona, where we could do our hospital, we did Ted’s office, we did Ted’s apartment, we did so many things there. That was very helpful. And in this case, we got the best location of all time, Sailor’s Snug Harbor, which is this beautiful 1830s Greek Revival campus that looks better than any college I’ve seen. We just did everything there, and when we weren’t there, we’d go a couple of blocks away to the residential streets around us in Staten Island, or to the little town that was near us for the diner and for the oak bar. Just having a dream location where you can do everything is one of the key things in low-budget film. When we were budgeting my Jamaican film, one of the problems was, I’d written something with far-flung locations, and the production manager was saying, “Here, the big problem is transportation, because it’s very hard and very slow getting around.” And so I saw an Army base where I thought that if they allowed us to shoot on the residential part of the Army base, that could be our dream location. But I may now have to redo the Jamaican script so I could do it with that kind of consolidated location. And also, the heightened realism and fantasy elements of this film have been good rehearsal for the fantasy elements in that film, because I have a lot of fantasy elements in that film, and I didn’t know how they’d come off. I think this experience was instructional for that. AVC: You got a chance to stage your first musical number in the sense of a Hollywood musical. WS: Yeah, that was great. [“Things Are Looking Up”] was one of the songs that was my touchstone as I was writing the script. I adore that song. This wonderful young choreographer, Justin Cerne, one of the happiest collaborations I’ve ever had. Mark Suozzo, the composer on all four of our films, and Justin Cerne were dream experiences, because these are people who know things that I know nothing about, really, how to do it. Although [Cerne] is co-crediting me for the Sambola dance craze. WS: Yes, because I enumerated all the moves I thought were really good dance moves, really fun dance moves, and he was able to incorporate them into a dance which is all fun moves.